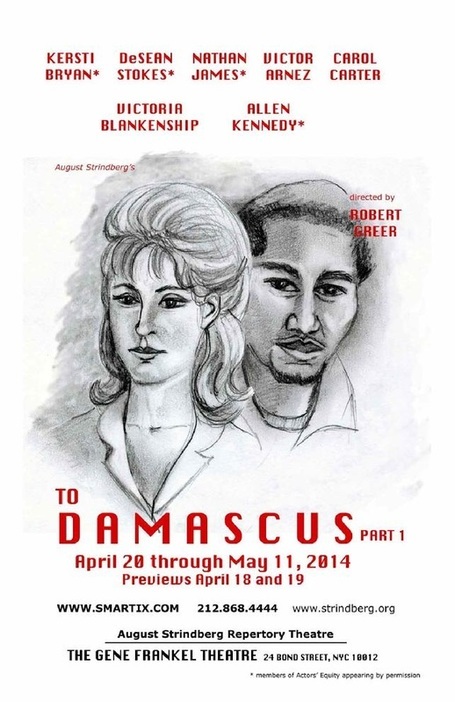 August Strindberg's "To Damascus, Part 1" will be adapted to Harlem, 1962, by August Wilson playwrighting fellow Nathan James with a multi-racial cast April 18 to May 11, Thursday, Friday and Saturday at 8 PM and Sunday matinees at 1:30 PM. The August Strindberg Rep will present Part Two in March, 2015 and Part Three in 2016, the first time the trilogy will have been presented complete in English and the first time in any language in 99 years! The Harlem 1962 setting was chosen by artistic director Robert Greer and dramaturg Nathan James, a frequent actor in Strindberg Rep productions. It seemed appropriate to place this expressionist play into an era where, at least in Black neighborhoods, the pace of social change had accelerated nearly to the point of surrealism. Not only had the Civil rights era come to a boil during the early '60s, but the first inter-racial couples had begun to appear in public. A partner in one of these couples was the literary artist Amiri Baraka. His parallels to The Stranger, the hero of Strindberg's play, were poignant to James and Greer and influenced their vision for this character. Part one of the trilogy has been described as "Strindberg's most complex play" and as "his greatest play," with its mix of myths, symbols and ideas and a profound spiritual analysis in a new dramatic form, and the trilogy his magnum opus, drawn from his near-total nervous breakdown, the marriage that preceded and precipitated it, and the restorative effects of the marriage that followed. The Strindberg Rep will present one part each Spring through 2016. Wednesdays at 8 PM, April 23 and 30 and May 7.